After nearly two decades of debate, the European Parliament approved the controversial Copyright Directive in the Digital Single Market (Mar 26). The legislation was passed by the European Parliament in Strasbourg, with 348 MEPs in favor vs. 274 against. The new Directive is intended to correct deficiencies in the original Copyright Directive of 2001. While pioneering at the time, provisions to strengthen intellectual property protection, reduce conflict in copyright laws and assure compensation of content producers, innovations in the rapidly developing digital world have made much of it ineffective. While the legislation only applies to the European Union, it is expected to have world-wide implications, which has led to wide opposition from digital rights activists and tech industry representatives, who fear it will force content platforms to adopt ‘upload filers’ and limit information sharing. Notably, two of its clauses, 11 and 13 (now 15 and 17 in the new package) have sparked controversy. 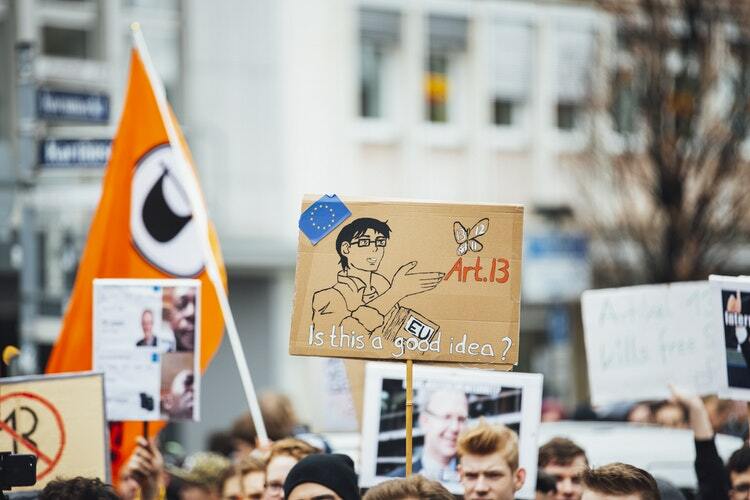 Last year, 70 technology pioneers appealed to the European Parliament president Antonio Tajani in an open letter, with web inventor Tim Berner-Lee specifically addressing article 13, which “transforms the internet from an open platform for sharing and innovation into a tool for the automated surveillance and control of its users.” In the days leading up to the EU’s verdict, protests took place across Europe, including the Austrian cities of Salzburg, Innsbruck and Vienna, under the slogan “Save Your Internet.” The largest protest was in Munich with an estimated of 40,000 taking to the streets. Supporters claim the law is long over due, including 260 publishers, newspapers, news agencies musicians and broadcasters in Austria, including Austria Press Agency, who see this as their opportunity to gain control over how their content is distributed online. This control, they say, is a necessary prerequisite to the internet remaining a diverse place of exchange for information, culture, and content. The law is expected to take effect on April 9, although Germany may still withdraw its support, making a majority difficult to achieve, leading to further negotiations after EU elections in May. Each European Union state will have two years to turn the Directive into law, leaving plenty of time to debate if, and how, the new rules would transform our use of the internet.